These multiple-step word problems require students to use reasoning and critical thinking skills to determine how each problem can be solved. These multi-step questions can be calculated using only addition and subtraction. 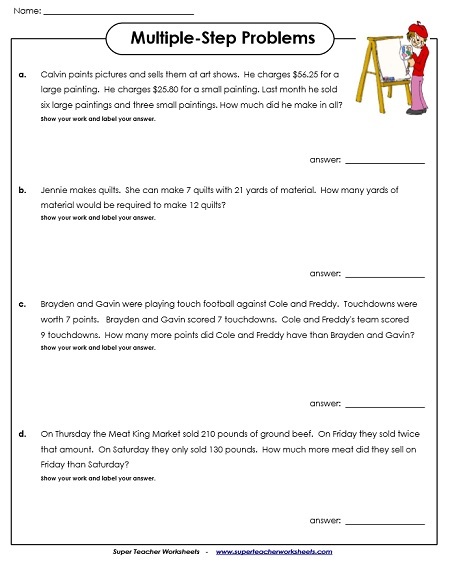 Students will need to add and subtract 2-digit and 3-digit numbers to find the answers to these multi-step word problems. Challenge your students to solve these tricky multi-step math problems. Each one requires students to add and/or subtract. These five word problems require students to add and subtract. Includes a money problem and an elapsed time problem. 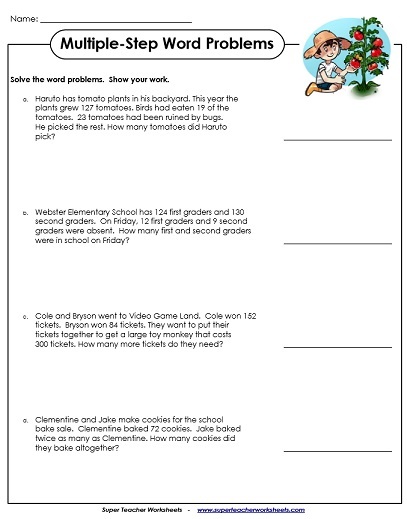 These word problems have a farming theme. Students use critical thinking to determine which operations are required for solving each problem. Use addition and subtraction to solve each of these four story problems. More multi-step word problems to solve. Students solve multi-step problems with an amusement park theme using money. Addition, subtraction, multiplication, and division skills are included. Solve multi-step problems with a movie theater theme. Skills include add, subtract, multiply, divide, order of operations, and algebraic expressions. Add to find the total cost of two toys pictured on the shelf. Then subtract across zero to make change. These four word problems require students to add, subtract, multiply, and divide. Includes a money problem. Find the answers to the four word problems. Students will need to use reasoning skills to determine whether they should add, subtract, divide, or multiply. 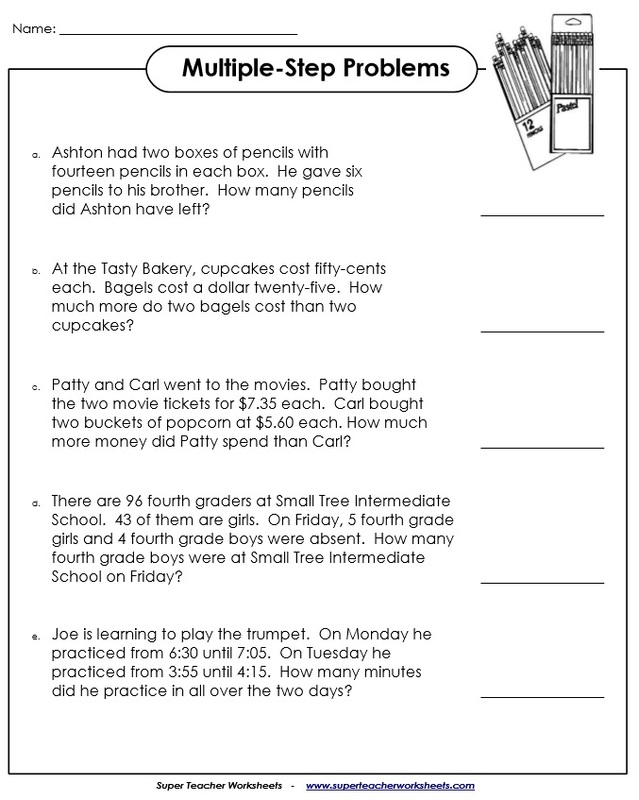 Practice multi-step problems with these four word problems. Students must use critical thinking to decide whether to add, subtract, multiply, or divide. This worksheet includes one money problem. These word problems are sorted by type: addition, subtraction, multiplication, division, fractions and more. These worksheets, sorted by grade level, cover a mix of skills from the curriculum. S.T.W. has thousands of worksheets. Visit the full math index to find them all, sorted by topic.